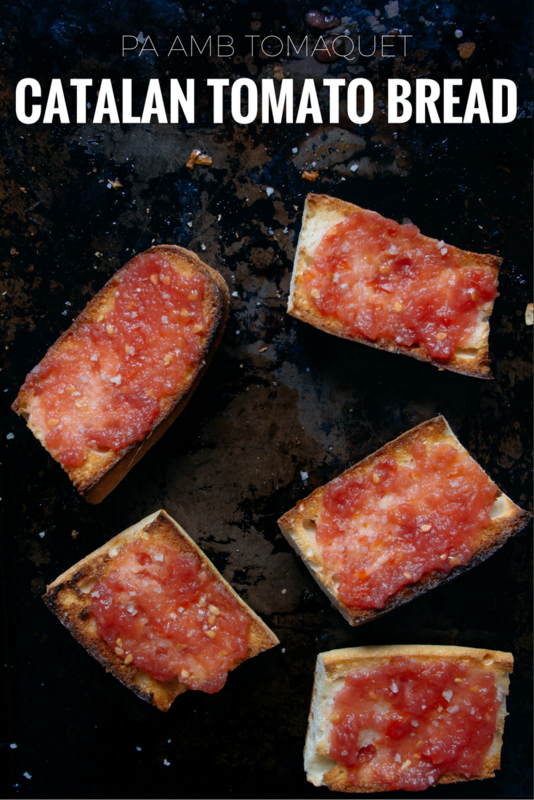 Many know pa amb tomaquet as pan con tomate, which is the Spanish name for it but it originates from Catalonia. 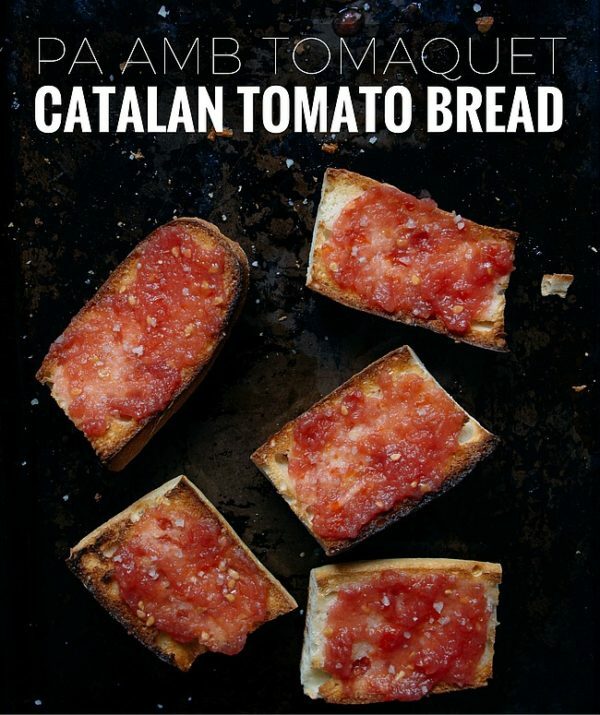 Pa amb tomaquet is a classic Catalan tomato bread, which many mistakenly call pan con tomate as that is the Spanish translation. Yet it’s not a Spanish recipe but from the Catalonia region in Spain. If this is the first time hearing about Catalonia don’t worry it’s not some obscure region. In fact the capital of Catalonia is Barcelona. And the colours of its flag are red, yellow and blue – also the colours of FC Barcelona. Catalans are fierce and the first to say Catalonia is not Spain. The same way separatists in Quebec do not want to be part of Canada. It’s a separate language, but more importantly completely different culture. 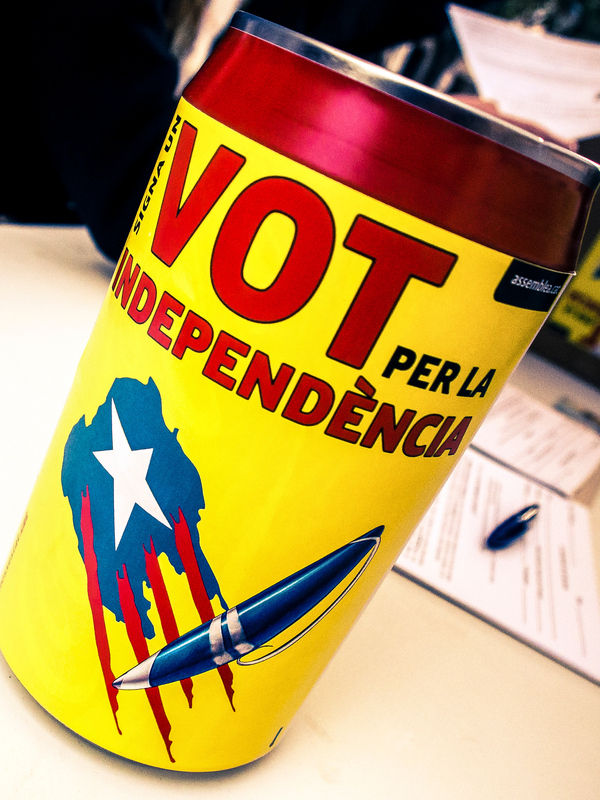 Unlike Quebec, Catalonia has a better chance of separating. It’s in the north and breaking from the country wouldn’t cause a geographical issue. Catalans in Spain would likely form a new country with Catalans in Southern France. But Catalonia is also one of Spain’s wealthiest regions, which you would assume brings power. But it does not. And in a fledgling economy with great debt the Spanish government does not want to lose the money of Catalonia. But it’s also a region with beautiful ancient towns and it’s easy to cycle through medieval towns like Peratallada. But I wasn’t in Costa Brava to cycle, I was there to eat. I discovered this Catalan tomato bread in Costa Brava, the northeastern region of Spain. I spent two months there a few years back but didn’t write about it for many reasons. While I have conflicting feelings about my time there I do remember great food. Pa amb tomaquet and brings back warmer memories from my time in Costa Brava. Like all great food pa amb tomaquet is about simplicity and feeding a family on a pauper’s budget. Just four ingredients: one loaf of day old bread, garlic, good olive oil, salt and tomatoes. Traditionally the variety of tomatoes are a firm hanging variety that I also saw in southern Italy. They also rub them onto older bread. It can be eaten for breakfast or merienda. It’s usually served free at restaurants as a tapa or side dish. 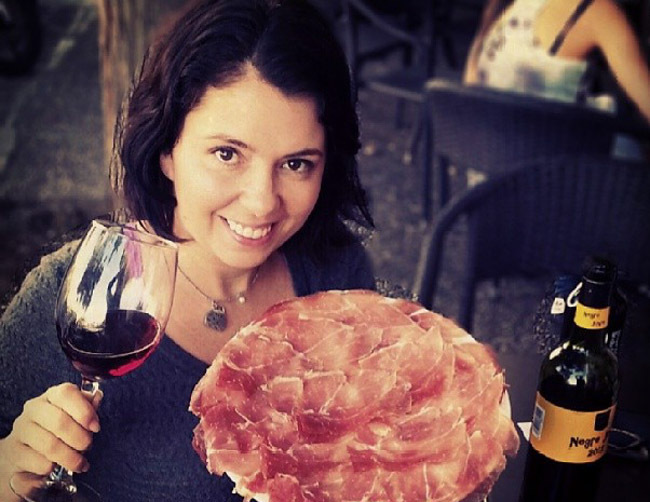 If you’re lucky they’ll top it with some jamon and along the coast you may find it with anchovies. Using classic mediterranean ingredients, it’s not surprising that pa amb tomaquet pops up in other regions under different names. The difference is that in Catalan tomato bread is served with the tomato already on the bread. Whereas in other regions it’s common to serve the bread next to a bowl of grated tomato, salt and extra virgin olive oil. This recipe is so simple it doesn’t require a recipe card. Traditionally you cut the tomato in half and rub straight onto the toasted bread that has been rubbed with garlic. This method is a bit tedious and you don’t get as much tomato on the bread unless you rub it frantically until it is soggy. Instead I prefer the “modern” method. Just rub half a beefsteak tomato onto a cheese grater (the largest holes) and you’ll get lots of great tomato pulp without the skin. Grate tomato pulp into a bowl. Toast bread in oven or on a grill. Rub garlic cloves onto bread. Pro Tip: Don’t skip on the olive oil or the salt. Don’t use iodized salt or crappy supermarket olive oil. Break out the good salt or at least kosher salt. I used this grey sea salt and extra virgin olive oil from Spain. This is a simple dish and much of the flavour of great pa amb tomaquet in Catalonia is the fantastic oil. Delicious, make me feel hungry already. Looks sooo yummy and yet so easy to make ! Just what I like. Thank you for sharing the recipe and the story of Catalans ! Oh those Europeans…so darn great at eating delicious things on a budget. 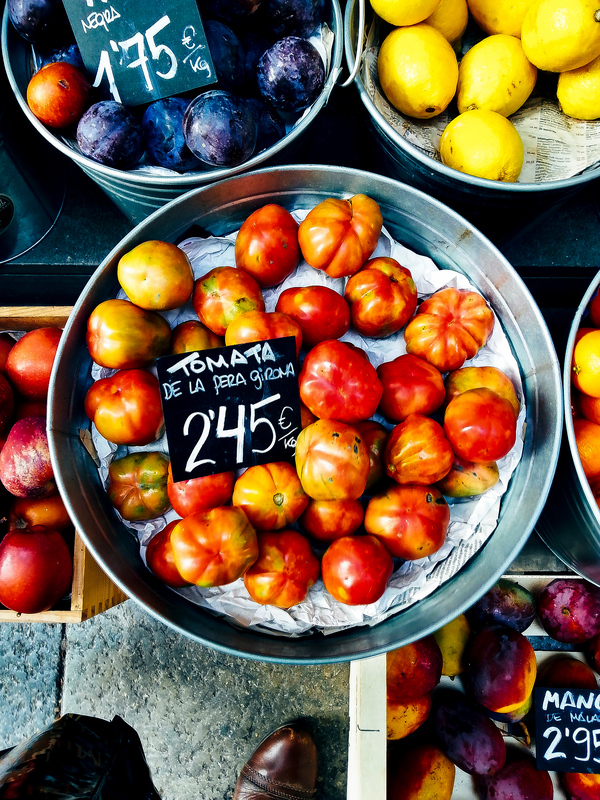 I really know next to nothing about Spain and definitely not Catalonia but this sounds like a place that is magical if they can make tomato on bread taste awesome! I’m always impressed when so few ingredients can come together in such a delicious looking snack! I’ve eaten this once, at a restaurant in Toronto, and it was so simple but so good. Thanks for sharing how to make it at home. Tried it in Spain last month. Love it! Looks delicious and something I would love! Like your “modern” method! Perfect way to use up left over bread. Great story too! I love the sound of this simple recipe. Honestly, foods like this can be some of the most wonderful and memorable in the world. Your advice about using only good ingredients is, to my mind, the most important part. I think I’m going to have to wait until we’re smack in the middle of peak tomato season, then just go to town and make this over and over again. Your modern method sounds ideal to me, as I wouldn’t want the bread to fall apart too much either. I also want to try to find a good Spanish olive oil – I tend to buy a lot from Greece, but I’m looking to branch out more. Lots to think about from such a simple food. I love it! Superb!…I always look out for such easy to make munchies.Thanks for sharing. This really looks yumm. Thanks for sharing.It’s easy to make and so, I am definitely gonna try it out soon. I’m on my way to BCN next month (first time) and am looking forward to tasting this myself. Honestly, it doesn’t sound that appealing. Soggy tomato bread. Ha! But it’s so iconic. I can’t not give it a try. Even if you don’t order it somehow you’ll receive it as it’s standard to give out. 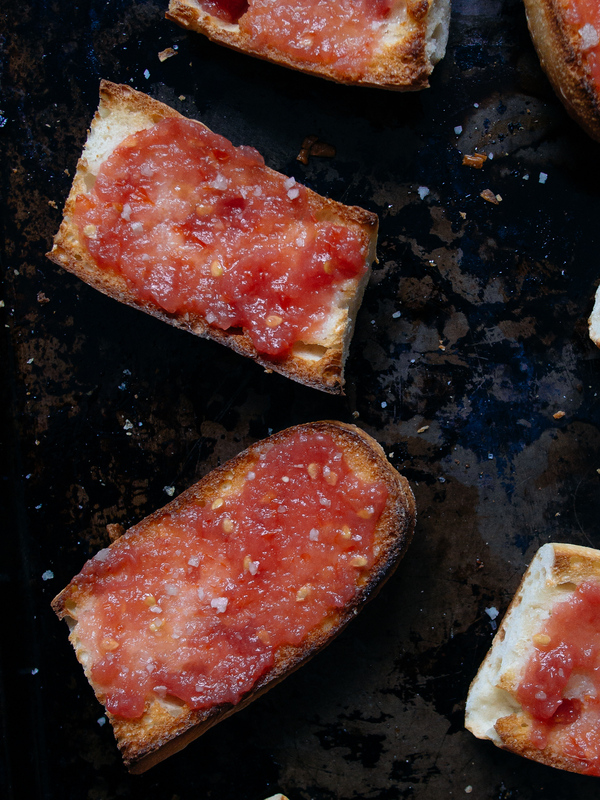 Think of garlicky tomato on crusty bread – it’s good!